Workers at Port Kembla Coal Terminal have retained the job security provisions they were fighting for, marking the end of a protracted and bitter industrial dispute with the South 32 management team. PKCT workers today voted up a new Enterprise Agreement in principle that guarantees their permanent jobs won’t be contracted out and gives them their first pay rise in four years. Negotiations have dragged on since 2015. The key sticking point was management’s insistence that job security provisions, preventing permanent employees being replaced by contractors doing the same work, be removed from the new enterprise agreement. The dispute reached a peak this year with management locking workers out for the past 50 days straight. 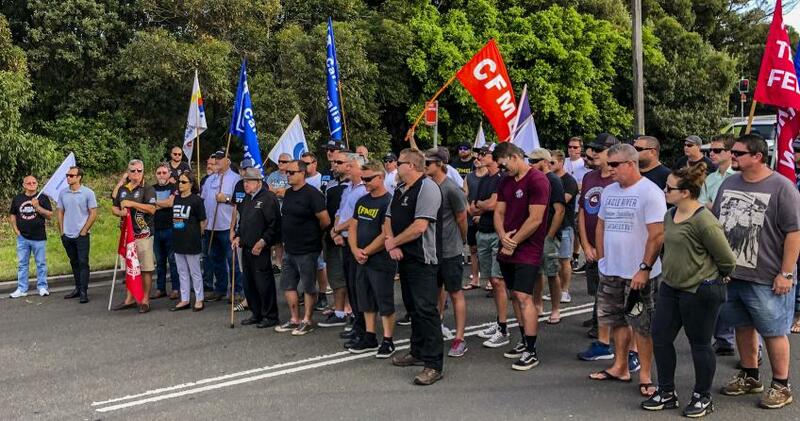 CFMEU Mining and Energy South Western District Vice President Bob Timbs said the win was vindication for workers who stood up for their rights. “This win shows the power of unions, the power of solidarity, and the power of standing strong,” Mr Timbs said. “I’m proud of the way workers stood and fought for their right to a secure job. I’m grateful for the way the Illawarra community and Labor politicians stood around them. And for the incredible support, we got from the South Coast Labour Council, the Maritime Union, and other unions. “But I’m disappointed that this bitter and bruising dispute happened at all. “The agreement we now have could have been voted up well before Christmas. Since then workers and their families have been put under extreme stress and pressure by excessive lockouts. This kind of dispute just drains goodwill from the workplace. CFMEU National President Tony Maher said the win once again highlighted the importance of workers standing up to mining companies’ push for cheaper, outsourced labour. “This result shows once again this community will not tolerate attacks on quality, permanent jobs by mining multinationals,” said Mr Maher. “Companies need to get it through their head: this kind of bastardry will no longer stand. The community won’t accept it, workers won’t accept it, and unions will fight it tooth and nail. The new agreement also includes a 10 per cent pay rise over the next four years. Workers will return to work Tuesday at 7 am.